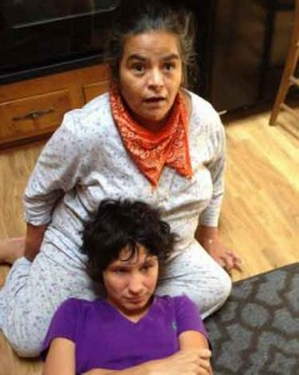 Home / Blog / Sedona -Non-Verbal Autistics Gift to Us! Last week, I was given the opportunity to spend time with an amazing group of people in Sedona AZ. The families of 3 non-verbal autistic young people hosted an event in Sedona. 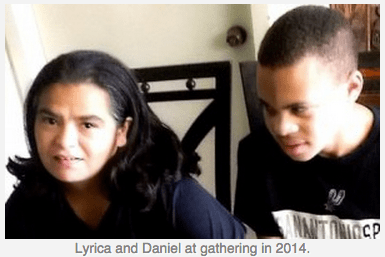 These Autistics, Lyrica 39, Adri 33, and Daniel 20, can communicate very clearly through facilitated communication … or through one or another parent telepathically. I have been connected with Lyrica for the past 3 years and have experienced her communication ability. Lyrica and her mother, Gayle Lee wrote a book called AWETIZM, A Hidden Key to your Spiritual Magnificence. This is an amazing book. Lyrica writes about who the Nonverbal Autistics are and what they are doing on the planet and why more and more children will come in with Autism. What her work on the planet is- for her own embodiment, Karma, and for us. The event they produced was designed to let the world know about the capacity of these very special young people. It gives us hope to know that the planet can really change, that people really can change. That there are embodied beings and teachers here to show us that this is possible. That there is support, and that all we have to do is open our hearts and connect. These children are special and need to be treated as the teachers they are. When this happens it changes their physical reality and they become calmer. There has been an ongoing meditation in Stillness for the past year that has included these 3 nonverbal autistics, their parents and a group of 12- 20 others meditating in Sedona. Many other autistics join in telepathically. I was playing the crystal bowls as the opening for this event. The frequency of the room shifted in a most palpable way. 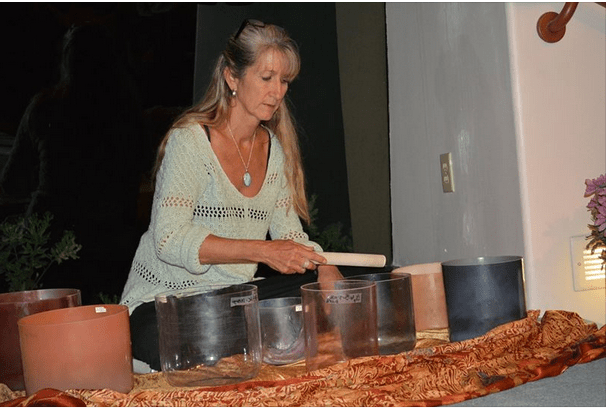 The sound of the Crystal Bowls supported people to come into a synergy together and open their hearts. The meditators in Sedona have been holding space for the nonverbal autistics and others, in person, on skype, and telepathically with the purpose of assisting them to embody the physical 3d realm more fully. When I was doing it in the group that night, there were 80 people in the Creative Life Center in Sedona. As I participated I felt a Golden light come into my head and I watched this Light come in and start to fill my bones. I couldn’t move even after we were out of silence. I watched the light descend further into my shoulders, and then my ribs and into my thigh bones and finally my feet as I sat cross legged on the chair. I felt anchored by this Light! And the Light was anchored in me. It was Quite an amazing experience! The information that these 3 beings are sharing will blast your heart open!! The awareness’s of the reality around us that we don’t see but that they live in are phenomenal and they give me hope! ~Lyrica My meditation experience is both of a heart and science vibration. Literally when the heart and science merge, doorways open. In the doorways hover downloads as ancient as the universe’s beginning and as new as the earth yet to come. As a heart scientist, I must enter deeply into my own physical experience to begin to translate these divine emanations. I can feel my light literally pulled deeply into the doorway of the sacred mystery, where I then become the puller and that which is pulled. In a birthing way, it is all so alive, and its life begins to live and breathe in me. As I feel its presence, I am aware of how much it has always been a part of me, for it is my nature to hold and know these things. Decoding these mysteries sets my soul on fire. My longing to go home, a forever whisper in my heart, is suddenly and completely fulfilled. I have fallen deeply in love. With whom? With me, the sacred alchemist awakening in me as the blood of my soul and the footprints of my destiny. 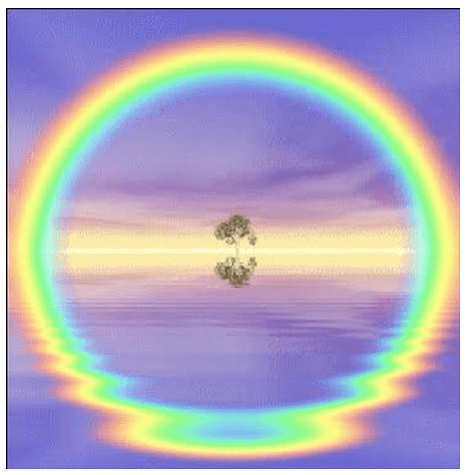 In joy, I bless The New Earth Academy as a holy foundation for the lost art of alchemy. Here in a divine partnership of humans merging with the forces of nature, we can co-create the New Earth, no longer just a dream, but a realized sacred heart community of so many beautiful beloveds living in divine harmony and unity. ~Adri My most compelling experience in the meditation is love. Certainly I know of the kindness of love in my life, I feel it every day from my mom. Yet this love transcends anything I have ever known in the physical as it is love without a body, love without a story, love without an agenda. It approaches, for me, the face of God, shining forth through the nonverbal autistic essence of being, so pure, so divine, so ethereal, so peaceful, so sublime. I feel much activity and movement within me and all around me. I feel it as waves of love weaving and expressing higher and higher octaves of love, unity, and devotion. Not only do I feel deeply this heart resonance, but I hear it and see it in bursts of sounds, colors, sacred designs, almost like explosions of love creating love. Within this sacred pageantry, I begin to remember that nothing is happening outside of me. That’s when the true miracle pops in. I awaken to my truth that I am co-creating and becoming all of this wonderment in union with so many of my beloved brothers and sisters and all those who are offering us a safe heart space in which to incubate and disseminate our New Earth gifts to share. ~Daniel The meditation experience offers my nature its highest domain in which to be and create. Here, fully supported by the light chargers, the other nonverbal autistics, and the meditator hearts, I enter into sacred contract with so many divine presence beings. Together we are designing and constructing a vehicle of transmission to receive, hold, and ultimately share downloads of light, technology, and ordination protocols for New Earth pioneers. It’s like we are birthing an ark of enlightenment. Yet to build such a resonate structure, it all takes place in the proper energy placements, relationships, and sequences so that the energy becomes the divine blueprint and initiator for its own unfolding into form. Oh, how much I love becoming the wave and helping to weave this energetic platform for all of our New Earth experiences to come. Free of my physical form, I flow within the rhythm and cadence of pure fluidity. I feel almost like there’s an orchestra playing within me and I am the conductor. Sometimes I move in the soft sweetness of a violin, sometimes the loud blast of a trumpet, or other times the deep rumbling vibration of the drums. It all carries me into a state of sheer ecstasy and that’s when I am expressing the me that I most adore to be. Their words give me hope, again and again! And how do I stay in that resonance? How do I stay in that frequency of Love that seems to be so fleeting? It takes a lot of presence and observation of one’s self.